The Twilight Sad, the most singular of a new breed of British noise bands, move up a gear towards the release of their sophomore album ‘Forget The Night Ahead’ with the release of a brand new single ‘I Became Prostitute’ on the 3rd of August. The band have been busy previewing new songs on both sides of the Atlantic with recent US dates with Mogwai, and a UK headline tour in May which included heart-stoppingly intense performances at three Stag and Dagger events and two sets at Brighton’s Great Escape Festival. In lyrical terms, the new album is possibly a darker set even than its hallowed predecessor ‘Fourteen Autumns and Fifteen Winters’. Singer James Graham’s portentous knack for forcefully delivering unsettling lines remains very much intact. Musically too, the forthcoming record is no less tumultuous, weaving between startling melancholia and coiled tension, its broad cacophony stretching to produce the band’s most simultaneously melodic and abrasive moments yet. 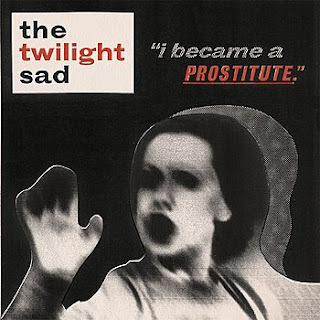 ‘I Became A Prostitute’ falls at the more melodic end of the scale, reminiscent of ‘Heaven Or Las Vegas’ era-Cocteau Twins, ‘Wish’-era Cure or indeed My Bloody Valentines’ ‘Loveless’ period. A siren-like guitar line drags the ear in immediately; tremolo’d and unflinchingly dark. Graham’s vocals soar with an inimitable despair and desperation over a deceptively simple instrumentation of Joy Division-like depth and impact: each drum beat measured and thunderous, each squalling guitar riff at once apocalyptically dischordant and beautifully harmonious. The song’s chorus is gripping, the band’s emotional input palpable. Produced by guitarist Andy MacFarlane with the assistance of the Delgados’ Paul Savage at the legendary Chem19 Studios in Glasgow, the entire sound of the album is consistent and full-bodied, an abyss of peeling instrumentation surrounding, bracing and engulfing some of the most singularly flooring vocal deliveries this band has ever produced.